If you own this little pet then you are probably worried about what he can eat and what not. Their digestive systems are quite sensitive, so you always need to make sure you are giving him food that is not going to hurt him. Since he enjoys eating vegetables, especially green ones, and sometimes fruit, at some point you ‘ve asked yourself, and what about tomatoes? And the answer is, no. They are not recommended. And here is why? Your little furry friend can’t eat tomatoes because they contain a lot of acid, which can be deadly for them. Besides being life-threatening, it can also cause diarrhea and vomiting. Serious stomach pain and constipation can also be a side-effect of eating tomatoes. So, it will be easy to notice if something is gone wrong, or he if he is having a bad reaction. When it comes to the tomato, the whole plant is not recommended. If you give him leaves, you will pretty much get the same result. Vomiting, diarrhea and stomach pains. So no part of this fruit is good for your little furry friend, so try not to experiment. Other symptom of giving your hamster tomatoes is also dehydratation. Dehydratation is very common in hamsters already, so eating tomatoes can only increase the risk of it. This can be best noticed by his sunken eyes, his loss of appetite and he will feel weak overall. If he gets to eat tomatoes, you should definitely get him hydrated as quick as possible. Give him water, or any sort of food that contains a lot of water, that will make up for the loss of it, that happened by eating tomatoes. Another way to determine whether your hamster is suffering from dehydratation, is to pinch his skin, and notice if it’s retracting back or not. If some of these symptoms appear then call your veterinarian immediately and ask for advice, or take him directly for examination. If you insist on giving your little friend tomatoes (which are, indeed, really healthy) then try to give him only half of teaspoon. After that, you MUST gve him water, and keep him hydrated. Tomatoes are an extremly healthy fruit, and some of the beneficial effects to our bodies are: cardiovascular support, they also contain components that support bone health and they have anti-cancer benefits. Vitamin A, betacarotene, Vitamin C and E, Niacin, manganese, potassium and many other minerals and vitamin are just some of the beneficial components this powerful fruit contains. So, it will definitely boost your little friends immune system, just remember not to give him too much, and don’t forget to keep him hydrated as well. If you don’t feel safe experimenting with tomatoes, then it is best to avoid them altogether, so you don’t make a bigger mess by trying to help him. 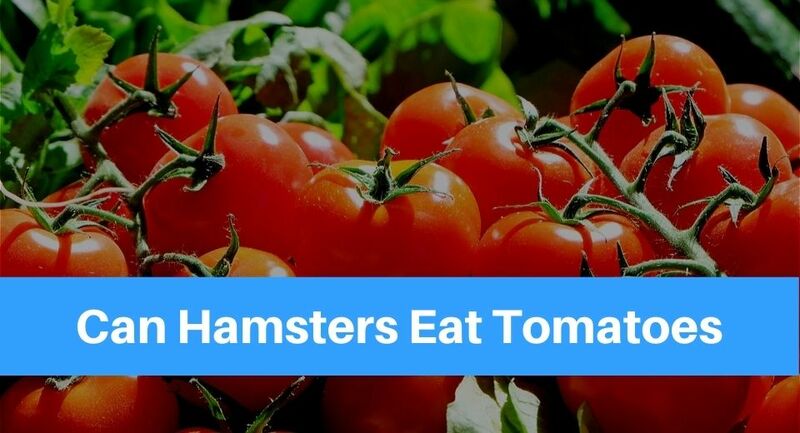 If you’ve ever typed in hamsters and tomatoes you will get results where hamster litterally run away from them. Their acid content is just too much for them, and they dislike it even at first sniff. They have a good way of showing us what foods they like and which ones they dislike. In smaller amounts tomatoes won’t hurt your little friend, but don’t ever give him more than a tablespoon. But, by his reactions, there is really no purpose in making him eat foods that he dislikes. Any type of nutrient you want him to get, you can find in food supplements, and foods that expecially made for hamsters. If he happens to eat more than the recommended amount, and you are worried about him, then contact your vet, and ask for advice. Give him enough water and make sure he gets it in his body before dehydratation strikes. In the end it is up to you whether you want to give your furry friend this healthy but also not recommended fruit. It definitely has it’s benefits and it will give him enough vitamins and minerals but on the other hand it is not recommended in bigger amounts. And, all we want is to keep our pet friends healthy, and the way they get their nutrients, therefore should be safe. Tomatoes are not recommended, but if you really insist, then go for the smaller amount and he will be ok. Previous Post:Can Rabbits Eat Bananas? Next Post:Are Dogs Lactose Intolerant?